I know it is the twenty-first century, but that doesn’t stop me from buying a typewriter. 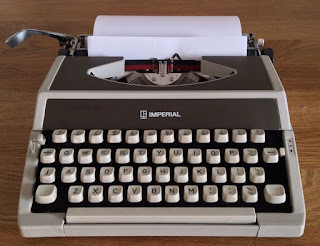 My nephew recently bought a second-hand one – of course, there are no new typewriters anymore – which reminded me of the one we had at home, before computers overran it over twenty years ago. Looking at examples on eBay, I wound up bidding on a grey and brown Litton Imperial Mercury, a grand name for what used to be a very ordinary machine. Anyway, buying a typewriter also means I can hear that particular clacking of keys and metal rods, a background to life and industry, that is just not heard anymore. This is not nostalgia, as I have grown up with computers, just as vinyl records are mostly being sold to people that grew up with CDs and MP3s. Old technology, if it works, does not have to be rendered obsolete or dead. I imagine receiving a letter typed on a typewriter will mean more than one printed from a computer: there is still an element of craft on the part of a writer, not as much as writing by hand, but enough of a change to make a difference to the reader. Anyone receiving a letter from me will now know what to expect. From this, you might expect using a typewriter would give me an ASMR (Autonomous Sensory Meridian Response), the curious, dubious abbreviation now given to the tingling in the back of your head or neck you get in response to a sensory stimulus of some sort. I only discovered a name has been given to this feeling when, after researching the typewriter I just bought, I found YouTube videos consisting solely of people typing letters, just for the viewer to sense the sound, and the physical act, of the typing. I’m sure it won’t be so great if you had the machine in front of you, engaged in a duel to harness the written word to create a work of great meaning, all the while trying to spell properly. For me, the feeling of release may only come when I stop using it. Having said that, I am looking forward to getting started! Meanwhile, the fox has been convicted of theft, and is currently awaiting sentencing.